Does this cover just make you roll. your. eyes?! I took part in a small bookclub last month and the book of the month was Regency Buck , by Georgette Heyer. I had absolutely no idea who Georgette Heyer was or what this book was about as I bopped around town trying to locate a copy. I assumed it was a classic so I kept looking in classic sections. Couldn't find it, couldn't find it. I eventually had to order it on Amazon (used) and it arrived, looking like what you see with "Romance" stamped on the side of it. This, of course, classified the book for me instantly and it was with great inward groaning and gnashing of teeth that I proceeded through the book. I read portions of it outloud to Jonathan. To mock it. If I ever refer to any of you as Clorinda you should not take that as a compliment. It read to me like a book Anne Shirley would have written and Gilbert Blythe would have mocked. In this story, Regency Buck , we meet Judith Taverner and her brother, Peregrine. They are orphans under the charge and care of a Mr. Worth whom they have never met. It turns out Mr. Worth is quite young, handsome and frequently misunderstood. (I wasn't quite sure, actually, if Heyer was poking fun of Austen's Mr. Darcy with her Mr. Worth but apparently that's not the case.) At any rate, Worth falls in love with his ward, Judith but it takes a long time for their relationship to unfold, of course. Peregrine is the comedic oaf on the sidelines who is mindlessly ridiculous but who brings a bit of mystery to the story. The compelling thing about this particular book is that it combines Heyer's two most well-known genres: Regency romance and mystery. I won't spoil the story for you, should you choose to read it, so I'll stop there with my description and simply inform you that I cared for none of the characters or the storyline itself. That said, I do find it historically interesting. Apparently Heyer was thought to know everything that there was to know about Regency England and with a handful of exceptions, all of the side characters in this story were real people. The places that she mentions in the book actually exist and the customs and manners of the time are spot on. From the perspective of learning more about how the upper class society lived in the early 1800's, this book definitely piqued my interest. Apparently too, this is the first of Heyer's books based in the Regency time period and "essentially established the genre of Regency Romance." (That is according to my sources.) That said, I'll leave it to decide for yourself whether Heyer did the literary world any favors. I am not a fan. This is not a scholarly review. This is merely a record of my love/hate impressions. It was curious from a historical perspective and absolutely loathsome in others. Since I'm known to not like romances, I would hastily make note of the fact that this book was first published in 1935 and therefore the book isn't racy as far as romances go. The cover art that you see above makes the reader assume there is more hanky-panky going on than you will actually discover between the pages. Heyer is harsher than Jane Austen. The dialogue between her characters is more biting and cold. I had a hard time with the spirit of the dialogue that existed between key characters and wondered how on earth they could ever come to like each other. It was all so very off-putting to me. chuckle, love your review! :) Those love/hate feelings for a books are so weird, aren't they?! I'm glad you're glad you read it, but I think I'll have to pass--my list of "books I want to read" is much too long. I've heard the name of the author but didn't really know anything about her. I've never been in a book club, but it sounds like fun. I've never read anything by Georgette Heyer. She is so frequently recommended, though! I don't think I've seen anyone say they disliked her books. Thanks for a different perspective! I'm so glad to see this made it to your blog! Mostly because I was there, but also because I had the exact feelings! While reading this: UGH!!! It's like throwing up cupcake frosting! While discussing it: Ok *grump* I'm kinda glad I read it. I've read some other stuff in book clubs and even if the book itself didn't turn around completely, someone usually has a great point. And you are left going, "Oh huh...I would NEVER have thought that." But, I probably won't try Heyer again either, to be completely honest. BerlinerinPoet - Can't stop laughing about throwing up cupcake frosting . . . ! Regency Buck is not one of Heyer's best. I wouldn't recommend it as a good introduction to her work. If I were recommending a first Heyer book, it would be The Masqueraders, Simon the Coldheart, or These Old Shades. She also wrote mysteries, but I found them dull. I haven't read any Heyer either...but many of the blogs I follow love her. Grand Sophy is one that was recently written about that was given HIGH marks. B&N had a sale on her eBooks for $1.99, so I bought 5-6. I love hearing different perspectives--and your anti-romance one is always fun for me. I'm generally rather fond of Heyer, in about the same way as I'm fond of Grace Livingston Hill. She writes clean, quaint romances that are perfect as escapist fiction. I've got My Lord John out of my no-longer-local library right now--and once I'm done with that, I'll be done with Eiseley's collection of Heyer romances. 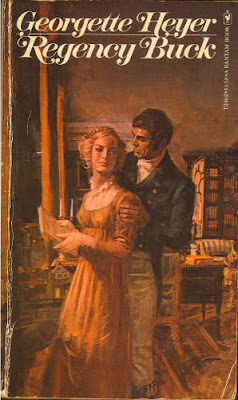 I've never read Regency Buck (unless I read it during my early teens when I was on a Regency kick), though, so I don't know how it compares to the others of her works (that I have read). Megan - I read that somewhere online. (I forget where.) Apparently this is not considered the best read for beginners. But I do think I had my fill, regardless. Bekahcubed - :D Well, I'm glad to amuse! hahaha! I have a confession - I like Georgette Heyer. It's total fluff and requires virtually no thinking, which is why I like it. For about 3 hours I can escape from my world of dishes, laundry, and handwriting lessons and enjoy dances, lively banter and tension of will the handsome lord and beautiful lady finally get together (read that with Anne-like dramatic flair). You are right that this is exactly the kind of book Anne would write. I find it funny that you love Anne but don't like something in the flair that she would write. My sentiments exactly! I've only read one Georgette Heyer novel, The Reluctant Widow, but I found it extremely petty and annoying. I'll gladly join you in the anti-sappy historical fiction club, even if we are a minority!